The following is page four of an illustrated proof for the sudoku.com.au tough puzzle of 01/30/08. Pages three, two, and one finely detail a manner for locating eliminations. This page will continue in similar fashion. Previous blog pages may be helpful. Links to these pages are found to the right, under Previous Entries. I may later list specific pages. For those who may be interested, I have altered the previous page to show a slight alternative to step 3f This addition may make my thoughts after step 3c easier to understand. Hopefully, it serves to illustrate that taking the time to find alternative elimination paths is often fruitful, as puzzle weaknesses tend to overlap. Since I am trying to detail how I find eliminations, I thought perhaps I needed to return to the previous mark-up. Typically, as I make the new marks, I try to think about how the new stronger strong inference sets (sis) effect what I alrady know about the puzzle. Below, find a list of marks and thoughts as eliminations were made. Step 3c => e25<>1 => not much to note on the mark-up, but.... make a mental note to return to the resultant stengths later. (8)f1=(8)f5 => circle (8)f5, promote underline at (8)f1 to circle. All of this is a precursor to the manner in which I found 3f and also step 4, which with a little added depth could easily solve more cells. (6)f9=(6)f6 => circle (6)f6, keeping underline & promote underline at (6)f9 to a circle. (6)d5=(6-1)f6=(8-5)f1=(5)f5 => d5≠5 - is this useful? (9)d1=(9)i1 => circle (9)d1, upgrade underline at (9)i1 to a circle. note ALS (1)b1=(pair58)bf1. My proof does not use this, but one can eventually eliminate (58)c1 using this concept. (4)a4=(4)g4 => circle (4)g4, promote (4)a4 underline to circle. Muse briefly about almost coloring. Now I am a bit confused as what to execute, as a number of eliminations are available to me. 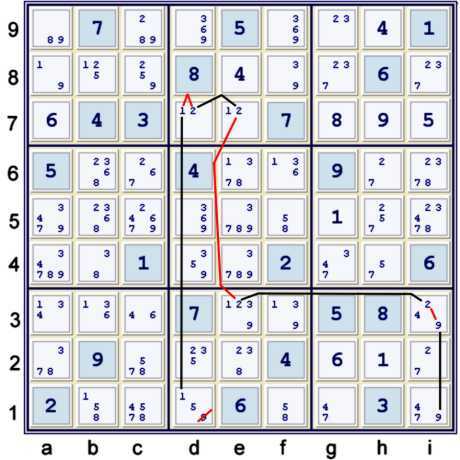 After some careful consideration, I estimate that eliminating (6)d7 is sufficient to break the puzzle if eliminating (6)f6 breaks the puzzle, At this point, I decide to use the less deep elimination, and if that gets me stuck, to return and use the deeper elimination. Thinking as I update the puzzle marks is generally very helpful. It lets me know what is really new. There is no reason that I can fathom to treat the puzzle as a new puzzle after each elimination. 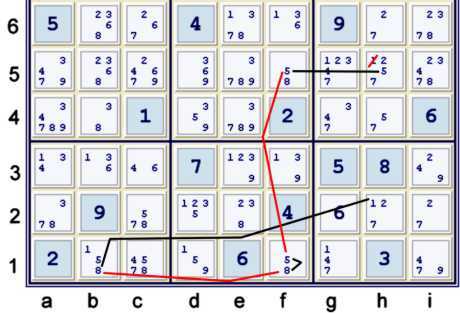 The main problem that I have with this puzzle at this point, and in fact with many puzzles at similar points, is that there are too many possible paths to take. The path illustrated below is one of many. The choice is fundamentally arbitrary. Below, find a straightforward chain, given (6)d5=(2)c6 as proven in the prelude to step 3f. 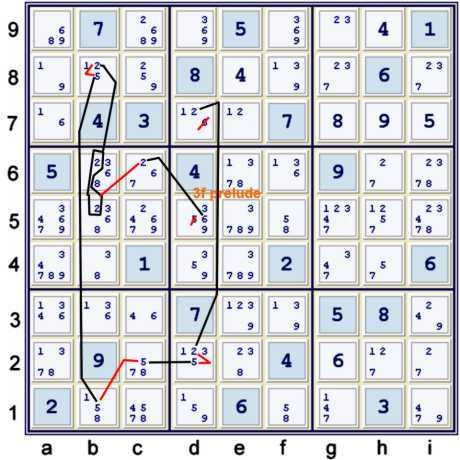 Usually, I am not certain after I solve a puzzle what I saw first. In both cases, (6)a7 % row. The (5) elimination from d5 is an added bonus of the illustrated version. I knew it anyway immediately after establishing the Hidden Pair 58 in column f.
The elimination graphed and the musings noted are an accurate reflection of how I work difficult puzzles. Remembering sis that have been proven is not only helpful, but silly to deny. Note that part of step 3f led to the conclusion above. (1)d7=(1)e7 => f8≠1, circle both (1)de7. (5)f5=(5)h5 => circle (5)f5, upgrade underline at (5)h5 to circle. (5)d4=(5)d12 => underline (5)d4 => Note Almost Hidden triple 125 conjugate with ALS 3695 in column d.
This group of updates were only mildly interesting by themselves. However, one of the steps considered earlier on this page seems like a great step to execute now, especially becuase of the added circled 5 at h5. One could write the next three steps together, but I am not sure that is the clearest way to proceed. Below, find the locked candidates elimination of f8≠1. The other elimination shown, a2≠1, I found very pretty to think about in the manner illustrated. There are, of course, other ways to find the same exclusion using the exact same sets. Significant updates to the mark-up occur here, noting (1)a3=(1)a8 and (1)d2=(1)h2. At this point, the overlap between candidates 1 & 5 at h5,d2 is hard to miss. Below find how I parce this relationship. 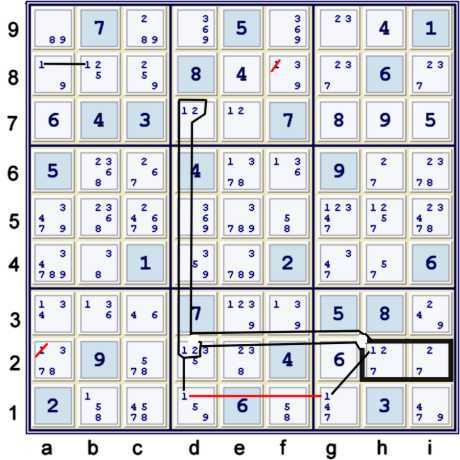 After making the elimination, (1)h2 % column and (1)g5 % row, box gets the puzzle to UP 31. Lots of updates can be made to the mark-ups. The most significant one, for me, was recognizing the new bilocal: (1)d1=(1)d7. This led to an easy step. The puzzle now can be cleaned up easily using standard fare AIC. The last page of this proof will illustrate one manner. Although one may prefer a better organized approach to puzzle analysis, I find that quickly brainstorming progressive chain snippets is quite helpful, and fairly fast. I do not want to bog down too long on one narrow analytic channel. Sorry about the long delay between pages. I cannot promise that the next page will be any faster! 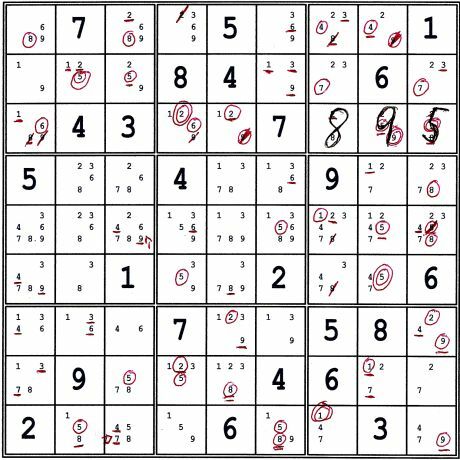 If only life were as logical as Sudoku! "If only life were as logical as Sudoku!" - I only meant that life is often not well served by purely logical analysis.